Seth Rogen just made a startling discovery about Home Alone. Seth Rogen just made a startling discovery about Home Alone that'll blow your mind. December is about many things. From spending time with family and friends to inhaling an insane amount of food, everyone has their own favourite traditions. But there’s one almost everybody can relate to. The annual viewing of Home Alone. 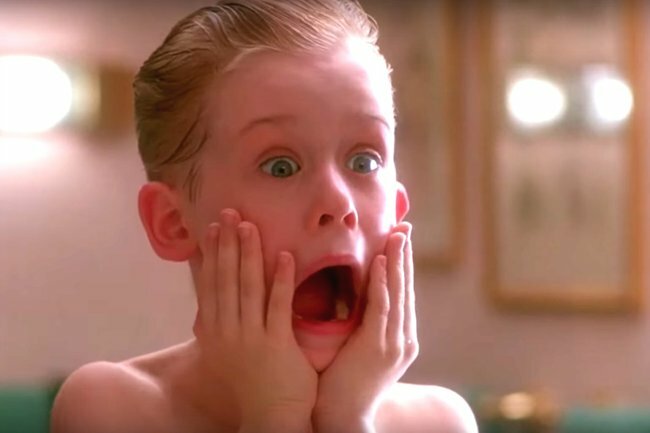 While it’s been almost three decades since the iconic Christmas film aired, it seems we’re still discovering new details about Home Alone year after year. Over Christmas, actor Seth Rogen shared a new revelation from the film – and it’s safe to say it’s pretty mind-blowing. In case you need a little reminder, the film’s main character Kevin McCallister used a number of inventive pranks to fend off burglars Harry and Marv. One of the most iconic pranks Kevin pulled involved using the audio from old gangster film Angels With Filthy Souls. A line from the old film’s character Johnny, “Keep the change, you filthy animal”, even became one of Home Alone’s best known lines. But as Rogen discovered, Angels With Filthy Souls isn’t actually a real movie. “My entire childhood, I thought the old timey movie that Kevin watches in Home Alone (Angels With Filthy Souls) was actually an old movie,” the comedian wrote on Twitter. While some Twitter users were aware that the film was fake, many were gobsmacked. I literally watched Home Alone yesterday and thought “I wonder if this movie Kevin’s watching is on Netflix too?” Dream crushed. What in the hell are you talking about?? It is! Right? Isn’t it? Even some celebrities were disappointed. I didn’t know it until you just said this. According to Vanity Fair, the black and white movie-within-a-movie was shot in an abandoned high school gym in Chicago. “I believe the title [Angels With Filthy Souls] was decided upon only because we needed to create a label for the tape Kevin puts in the VHS player,” Home Alone art director Dan Webster told the publication. A “sequel” to the fake film, titled Angels With Filthier Souls appeared in Home Alone 2: Lost In New York.